Once inflated, your little piece of paradise/square of rubber measures 8’ by 8’ which is enough to hold about 8 adults. While it’s great for a nice afternoon of tanning, there are tons of other possibilities available. 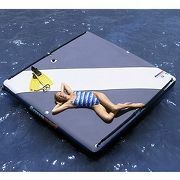 For small boats, kayaks, and wave runners, it can serve as a mooring station. A durable strap in one corner of the island can even be hooked up to a boat for a little bit of adventure. An anchor can also be attached to dock the island wherever you want, but that’s not included and no mention is made of where you can purchase it (or for how much). The best way to actually do the inflating is to use your own air pump or buy one for about $20 as one isn’t included with the island. A rapid deflating mechanism is built in so that you can easily stow the island within a few minutes of being done with it. Your little slice of paradise, mooring dock, or whatever else you can think to do with an 8’ by 8’ piece of rubber is only $320 away. That’s a lot less than a real private island will cost you.